COASTAL CHARM Simple, sleek and oh, so Beach Chic! Our Aqua Hurricane Wind light is ready to add a striking touch of seaside charm to your space, be it indoors or out. BEAUTIFULLY SIZED at 3 D x 3½ T inches, this is a vividly beautiful candle holder when a led or wax candle is added. Ideal for both tealights and votives. While intended for candles, it's also a fantastic casual vase for summer time blooms. A RHAPSODY IN BLUE the walls of this candle holder are gently textured with gorgeous translucent speckles and when a candle is added, an extra special shimmer makes for spectacular ambiance. CRAFTED BY HAND each piece is unique and no two are exactly alike. Designed to complement table tops and shelves, this versatile piece is at equal ease in both rustic style and luxe city chic homes. A WELCOME GIFT this piece is perfect to celebrate holidays, birthdays, weddings and many more. So gorgeous, you'll want to keep it at home for yourself. Enjoy! By Whole House Worlds Welcome to the product line of Whole House Worlds. The New York based company offers high quality, stylish products for every room in the house, and beyond. From the kitchen, to the living room, to the bedroom, dining room, home office, closet and garden: Our criteria are comfort, quality, style and value. COASTAL CHARM Simple, sleek and oh, so Beach Chic! 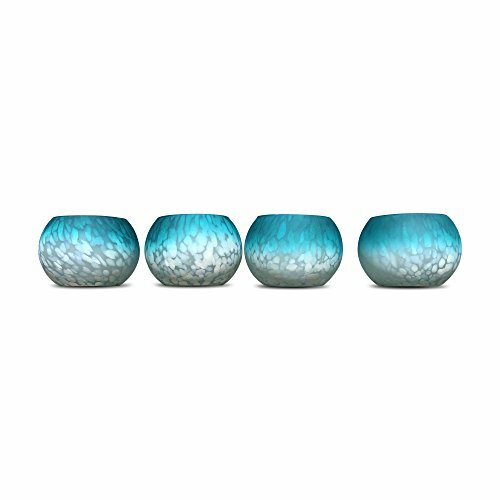 Our Aqua Hurricane Wind lights, set of 4 is ready to add a striking touch of seaside charm to your space, be it indoors or out. BEAUTIFULLY SIZED each candle cup holder in the set measures as follows: 3 D x 3 ½ T inches. Ideal for both tealights and votives. While intended for candles, it's also a fantastic casual vase for summer time blooms. A RHAPSODY IN BLUE the walls of this candle holder are gently textured with gorgeous translucent speckles and when a candle is added, an extra special shimmer makes for spectacular ambiance. CRAFTED BY HAND each piece is unique and no two are exactly alike. Designed to complement table tops and shelves, this versatile piece is at equal ease in both rustic style and luxe city chic homes.